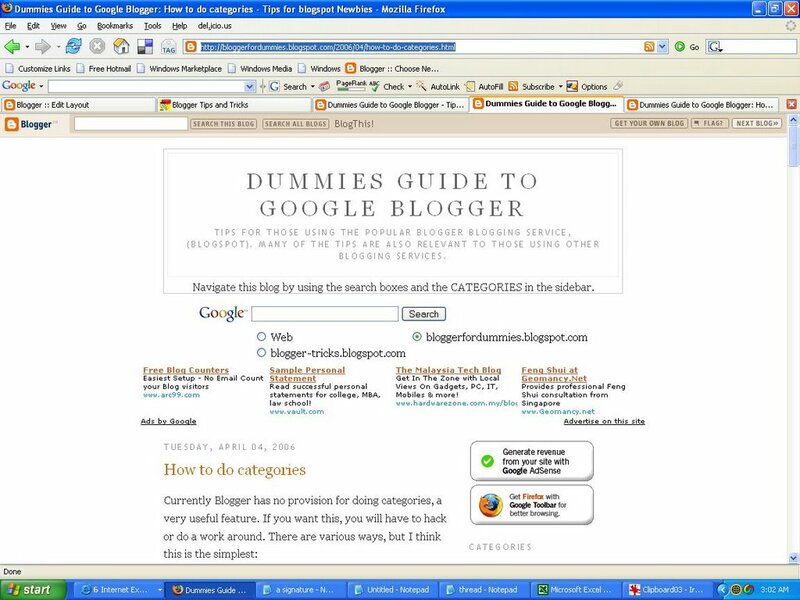 This post is a result of an alert and some links given by Sherry of Helpful Resources for New Bloggers (close new window to get back to this page) that someone is copying contents of my blog Dummies Guide to Google Blogger. Rather than describing what to do, I will give an account of what I did. 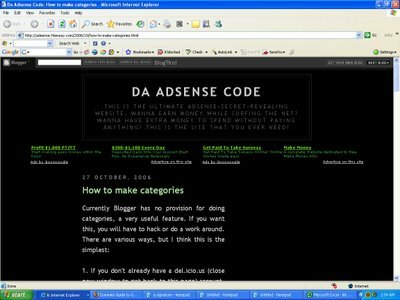 At this thread How to use Google AdSense with blog (close new window to return to this page), I followed the link in his signature line, and found a couple of posts which are exact duplicate of mine. I went to the individual post pages (permalink) make screen shots (Printscreen) with Irfanview. See screenshots below (click "BACK button to return to this page). My post from which he copied from (click screenshot to enlarge. 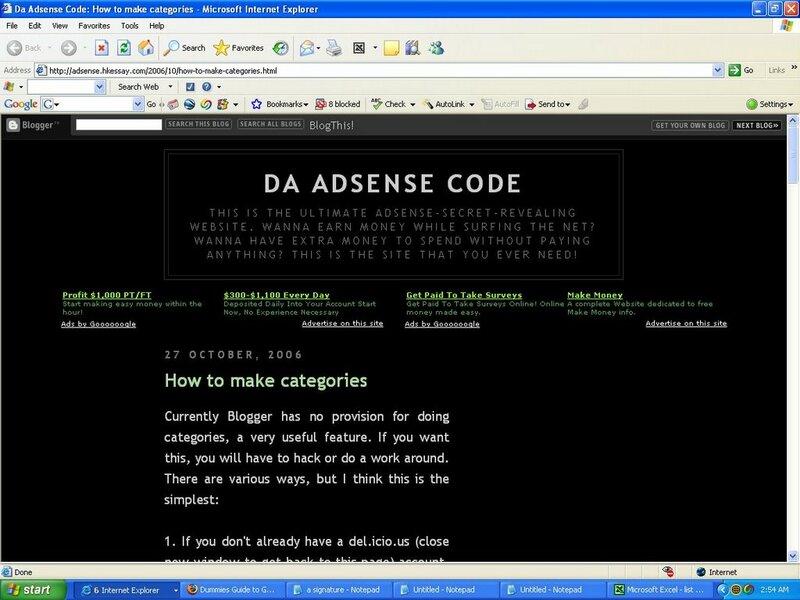 Click "BACK" button to return to this page): Note the differences in URLs and dates (27 October 2006 and 4 April 2006). To get the rest of the posts, I scrolled down and took a few more screenshots to show the similarity and saved them in a special folder. Further, I got the source code of his blog (in the menu bar, click VIEW and select PAGE SOURCE.This is for FireFox. Wording will be different in different browsers). 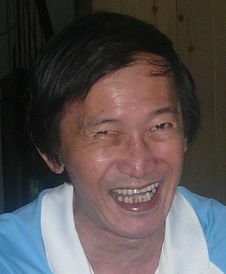 I looked for the AdSense scripts and copied his AdSense ID (pub-7471417268818747). This is to collect evidences. I let him know that I know his ID. I requested him to delete the posts and let him know of the consequences if he didn't. All this was done politely (no point making enemies online). Eventually, he did remove the posts and apologised, and that was done quite promptly. Lorelle did a very good article detailing what to do when your content is copied. See her article What Do You Do When Someone Steals Your Content (close new window to get back to this page). You should read what he has to say. If you want to deter potential copy-cats, you can put a warning banner from Copyscape. For an example, look at this blog: Star Home Improvements (close new window to return to this page). The banner is right at the top, just below the header of the blog. To get the script for the warning banner, you can go to Copyscape (close new window to return to this page). You can get different formats of the warning banner to suit the part of your site you want to place it in. For example, this bigger square format: . 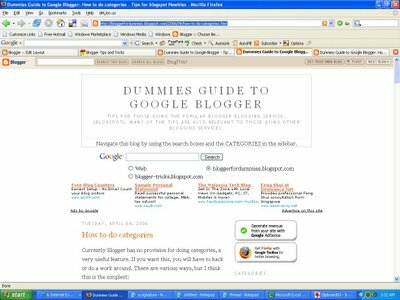 If you are using Blogger classic template, this post will guide you where to paste the script: Blogger template tutorial (click "BACK" button to return to this page). If you are using Blogger Beta template, to place it below the header (which I think is the best place to put it), see post Adding graphic to your Blogger beta header (close new window to return to this page). There are even bigger formats than the one I have shown, and if you feel that the banner shown are not prominent enough, you can choose the bigger formats for your blog to really frighten off the copy-cats. Note: I have tried Copyscape, and found that it was not very effective. However, they have a Premium version and also automatic monitoring with Copysentry (which I presume are not free). You may get better result with those. If you are serious about protecting your content and don't mind spending some money, I suppose you can try it out. In any case, I think their banner is a good enough deterrent to warn potential copy-cats, and that is free. This is not related to the topic but i'm using classic blogger and would like to know how to put a copyright at the bottom of the page. Thanks for the offer, but I don't make it a habkt of doing link exchanges. You have a nice blog. Keep it up. Peter have you done a post on putting in the subscriber box on one's site? Perhaps I should do a search.. I have a subscriber blox (Blogarithm) on my blog before. I think I have removed it. Reason, to test it, I subscribed myself. I found that I get notification of changes even when I only edit old posts, not only publish new posts. I edit my posts quite often, and I don't want my subscriber come to the blog and not find any new entry. That can irritate them. I wish I have the time to research other alternatives. I think you get the full post, which I would not like as I want the post to be read in my blog, not in an email. If they offer partial post, I may consider. Wish I have more time to research. I have a similar problem that you described in someone copying your Blog content. In my case I created a blog in 2004 to help people in the San Francisco area whose cars were towed illegally. It was basically explaining the Motor Vehicle Code etc. About a month ago the California legislature made some very significant changes in the law that will affect all of California. So I decided to change the ADDRESS of my blog from sftow.blogspot.com to predatorytowingincalifornia.blogspot.com I did not realize it at the time but I found out a few days later that the numerous times my old sftow blog has been linked to other web sites, including newspaper articles, were no longer valid. My old sftow blog pages were still showing up. BUT, here is the problem. I went back into blocker to either change the ADDRESS back or to create a new blog with the old sftow address to use for redirecting to my new blog. Low and behold two things happened. First, Blogger says that name sftow.blogspot is taken. By whom? Probably by me and they have not cleared it off their computers. I cannot imagine that anyone else would want that name. The second thing that happened is that when I, and probably anyone, click on my old sftow site I am redirected to some shopping sites that say things like Find what you are looking for at sftow.blogspot.com. I have also put the old address in the URL window and did a search and again it comes up with the same shopping site. This is insane. I have written to Blogger about this but they don't reply, except the usual we have recieved auto reply. The shopping site does not have a name or contact. If I knew how to contact these people I should be able to explain the situation to them and hopefully get them to stop the hijacking of my old site. Thanks and I am hoping someone has a good idea that I can use. Thanks, Rose, for pointing that out. As I have mentioned before, I am Asian and may not be that familiar with Westerm culture. The mistake will be corrected. Thanks for the info. I visited Lorelle's blog as you suggested and I have sent a letter using the template she recommended. Thank you for this helpful blog. I have found that the content of my commerical blog is being copied and redistributed with another persons name as the author. Very frustrating!